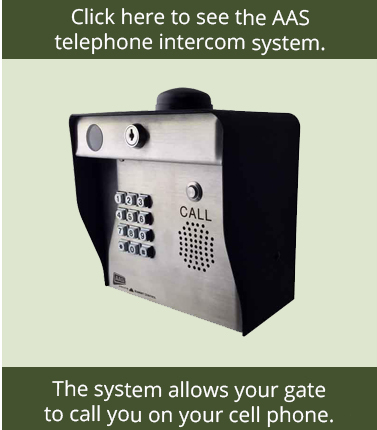 The Carin B&W Video Intercom System is compatible with: All none solar gate openers. Most people use peepholes or chain locks to answer their door without being completely vulnerable, but even these long used designs have their flaws. Chains can be broken, peep holes give away you are there and it is difficult to question unknown visitors. 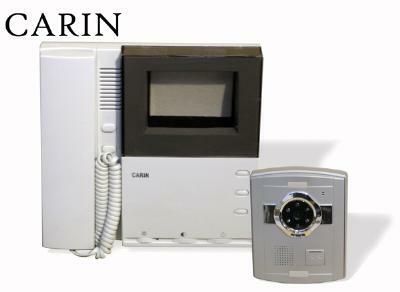 Protect your family with the Carin Video Door-Phone. The outdoor video component has a built in lit door-bell that ring the inside unit. You then have the choice of just viewing video or picking up the hand set and viewing and speaking to your guest. The system can also be activated without prompt from the outside unit. Say your visitor knocks, many units you would not have an option without initiation from the outdoor unit. The Carin Video Door-Phone can be activated by pressing the view button or by picking up the handset. The high resolution black and white video system provides a clear image of who's at the door. The camera works in low-light situations using inferred LEDs built around the lens. Installation is a breeze with the ready clip pre-installed quick wiring connector. With just a snap you can connect the two units through a door. If you want to run the wire through a wall or mount the indoor station further away you can run up to 150' of CAT 3 wire to make a connection. Quality and reliability is the name of the game when it comes to home security. The Carin Video intercom is so reliable as your personal security doorman that it is one of the only video intercoms to come backed by with a manufacturer's 2 Year Manufacturing Warranty standard! Available stainless steel weatherproof flush mount option, select above. Indoor Unit Size: 8 1/2"x8 1/3"x2 1/3"
Standard Outdoor Unit Size: 3 3/4"x5"x1 1/4"
Optional Flush Mount Outdoor Unit Size: 5"x8 1/4"x2" - Inset Section 4 1/4"x7 3/8"x1 1/8"
"The Carin video intercom is the epitome of reliability and simplicity. It functions with such intuitiveness that anyone, even the technically inept, can operate it. Wondering what might be going on outside, push the view button and up pops an image, day or night, of what is out there. Satisfied with what is out there, walk away, it will shut off in 60 seconds. If someone rings in through anything, the intercom, your doorbell, knocking, whatever; just pick up the handset, the picture pops up and you can have a two way conversation with your guest. They don't have to do a thing, just start talking... no confusing instructions for them to push a button, no crazy back and forth of having to press to speak/let go to hear, etc. If you choose to you can also set up an electric lock and then just click the release button and your door is free to open. The low light LEDs work great on this unit. You don't even need to flip the porch light on, the street lights combined with the low light LEDs are enough. This is a great thing because at night you don't need to let the visitor (possible intruder) know you are home or even looking at them. You could be calling the cops while they are still wondering if you heard their knock. 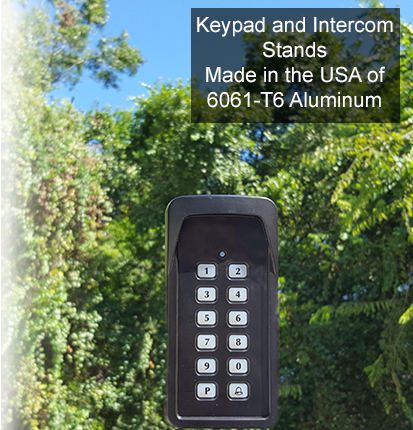 The standard outdoor camera/intercom can't be mounted in a position where it will be rained on, this doesn't however mean it needs to be encased in plastic or anything; an overhang long enough to block angled rain and direct sunlight is enough. If you don't have that option, no problem, the option you see up top is a weatherproof, flush mount outdoor station. The wiring is easy too. First off, if you are going through a door, video system on one side and camera on other (the included bracket that holds the video/handset is extremely secure to make this possible) like a peephole is then all you have to do is drill a hole and clip the two units wire sets together. The clips are already attached, how easy is that? Let's say you want to mount in on your wall instead. All the colors on both units are the same, just match blue to blue, black to black, etc. You can use CAT3 wire, which they sell for next to nothing at the big hardware stores. The wire is real thin, you can use a 3/16th bit to drill a hole in your wall to feed this wire though and just back fill it with some weather proof caulk to prevent bugs from trying to come in (soldering .and heat shrinking the wire makes the best connection - instructions for doing so are included in the manual). 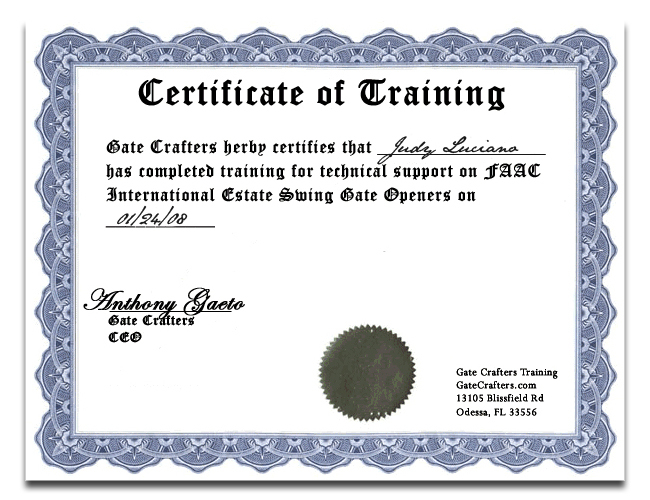 GateCrafters.com was selected as a Carin partner because our profound commitment to customer service. Every member of our technical support staff has had extensive training. We are available 7 days a week for support, even during holidays, from 9 A.M to 9 P.M. Eastern time. Also we will make ourselves available to you after hours upon request for installation questions absolutely free. 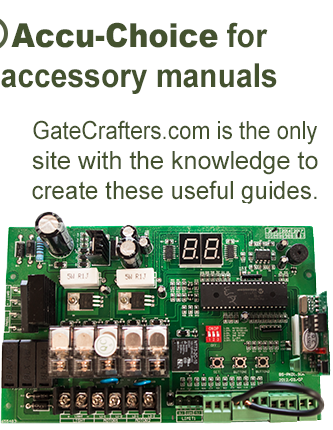 I believe every customer will find the support they need at GateCrafters.com and that is what has lead us to be the number one seller of gate openers in the world. I stand behind the values of GateCrafters.com and would like to invite you to give us a try. You will find the service, knowledge and enthusiasm can't be beat; and the price will amaze you as well."